Poinsettias are an easy to care for flowering plant that should easily last for the entire Christmas holiday season with a few basic suggestions. Place the plants in well lighted location. 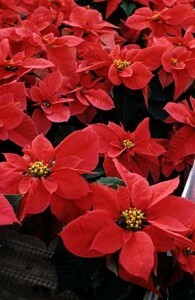 Poinsettia generally do best at the same temperatures most people keep their homes in the winter from 60 to 68°F. Cold temperatures below 55°F will damage these tropical plants. Water when needed, which is usually when the surface of the potting soil feels dry, but the plant still feels a bit heavy when picked up. If the plants dry out too much, they will lose their lower leaves. Drying out is probably the main reason plants die early in the home. In a good location with proper care, many homeowners report that their plants will last until spring – which may be too long for many of us! For more information on taking care of your poinsettias and on reflowering them, see Consumer Care of Poinsettias.